Each year UC San Diego hosts the annual Entrepreneur Challenge to celebrate innovation on campus. And each year, Rady School of Management students and alumni bring their brilliant startup ideas and launched companies to the stage to compete with fellow Tritons, sweeping the competition and earning thousands of dollars to continue developing the product or technology. 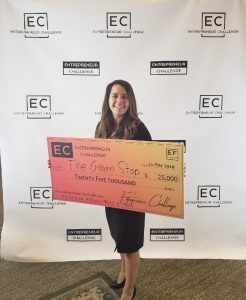 The 2018 Entrepreneur Challenge was no different. The majority of teams competing in the competition were affiliated with the Rady School and worked with one of the School’s many accelerator programs. The competition featured three tracks — Clean Technology, Life Technology and High Technology – and Rady School affiliated teams won first prize in two out of the three tracks. Rady School affiliated teams swept the High Technology track, earning first, second and third place. StartR team GLXY – technology for weight training by preventing injuries and plateaus for athletes – earned first place. Family Proud – a mobile-application based patient advocacy software solution that provides hospitalized patients and their families easy and secure access to all their essential social, medical, and logistical resources – took second place. Beggy, mystartupXX and StartR t eam developing a new and trendy approach to convenient and functional Smart Bags, earned third place. Navega – a mystartupXX team – took home first place in the Life Technology category. The company is developing technology to conquer the opioid addiction epidemic in the United States using addiction-free pain management. CReATE Medical,a StartR team, earned second place in the competition. CReATE is a patent-pending algorithm that analyzes routinely-collected patient data utilizing machine learning techniques to predict highly accurate patient-specific outcomes to pacemaker-related heart surgeries. Green Stop won second place in the Clean Technology. The Green Stop is a mobile, solar-powered, waste-free refill station that can be used at the beach to reduce plastic pollution and provide filtered and chilled drinking water to beachgoers. Pierre Sleiman (MBA ’13) gave the keynote address at the event, detailing how he was able to start his successful business, GoGreen Agriculture. He credited the Rady School for helping him develop the necessary entrepreneurial skills to launch and sustain a successful business.